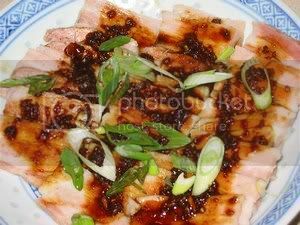 At long last i have finally managed to make a decent yau char kway, thanks to my dear friend blogger, tt. With lengthy discussion on the liquid and other ingredients, i have come to understand that the flour needed much more liquid than stated in the recipe. I have made so many recipes, following them to the tee, and failure. My friend Lena, said - lily, you are not make to be a yck lady. forget about it. All the failures happened because of where i am residing. Being a mile high above sea level and no humidity, baking and cooking have to be fine tuned and adjusted accordingly. In this case, the flour here is extra dry and needed more liquid. tt's recipe only needed 180 ml but i needed 240 ml to make it the right consistency. There are not many ingredients but alot of practise is needed to form uniform yck as the dough is so sticky and soft. Dissolve ammonia and salt in water and pour this mixture into the flour. Dust hands and dough with flour. Check to make sure oil temperature is 380’F. Take a piece of yck, stretch it and drop into the oil. Leave it along until it floats, it should float within 10 seconds. Once it floats, use chopsticks (one in each hand - this i am not able to do) to constantly turn the yck as it expands (it should reach its maximum expansion within 30 seconds). After it has expands as much as it could, continue to fry it turning every 10 seconds or so until it is golden brown (another 3-5 mins.). After shaping the ycks, the longer you let it rest the puffier it will get when they are fried (you can fry right away if you’re in hurry). When yck is ready for frying, move pastry board with the strips of yck as near to the frying utensil as possible so that it goes into the oil without stretching too much. Since i fry the yck one at a time, i will fry them until they reached the maximum expansion. When all the strips are done frying, then i bring back the oil temperature to high and refry all the yck until golden brown. I will leave in a 250 f oven for 5 - 10 minutes to further crisp and loose some oil. Cook gula melaka, sugar and water until syrupy. Add grated coconut and sago and cook until sago is cooked and coconut is dry. Leave to cool and divide into 16 pieces. Mix glutinous flour with cornflour in a large bowl. Bring coconut milk, sugar and oil to the boil, remove from heat and add pandan paste then pour over the flour. Use a wooden spoon and mix into a dough. Knead until smooth. Divide dough into 16 pieces and rest dough covered with a damp cloth. Take a piece of dough, flatten and plsce a part of the filling in the middle, wrap up filling. Make sure to cover filling thoroughly. Dunk into coconut milk glaze and coat generously. Put in the middle of greased banana leaves and turn ends in. Repeat with the rest and steam in boiling water for only 12 - 15 minutes. 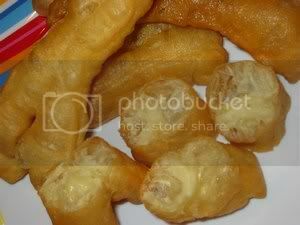 Kuih koci should be served warm but if you are in the tropics it can be served in room temperature. 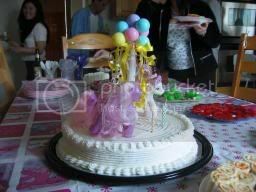 How time flies, it was like yesterday that i made Renee's baby shower cake and now she is four. 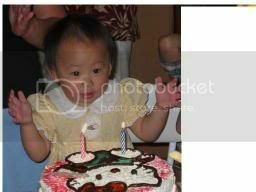 The earlier cakes are made before my blogging days so the pictures are the best that i can get from her album. One Year Old - The design is a cut out from the goodie bag. 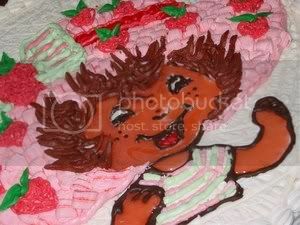 Two Year Old - Hello Kitty is outlined with melted chocolate and filled with homemade piping jelly. Three Year Old - My Little Pony figurines were borrowed from Renee's collection. Pre heat the oven to 160c/350 f(convection). Sieve the cake flour, baking powder and salt. In a bowl, combine the egg yolks, sugar, oil, strawberry and water. Whisk lightly, then add the flour to the egg yolk mixture. Mix until the batter is smooth. Set aside. Whisk the egg whites lightly and add in the cream of tartar and sugar. Continue to whisk until the mixture is stiff. Do not overheat or allow the mixture to become dry. Set aside. Gently fold half the beaten egg whites into the egg yolk mixture and blend well. Fold in the remaining egg whites and work very lightly with a spatula. Make sure the mixture is well mixed. Place the finished mixture in an ungreased 12" cake pan (i lined with aluminium foil so that the cake can be removed by lifting out the foil and then tear away). Level and bake in the oven until golden brown (about 45 minutes). Remove the cake from the oven and invert the mould. Allow it to cool for 1 hour. Do not remove the pan while the cake is still hot. In your mixer bowl, beat the shortening until it's smooth, add the butter and beat together until smooth and light and fluffy. Add smaller amount of the heavy cream indicated in the recipe and the vanilla and mix well. Add half the powdered sugar and mix for 5 minutes on low-med. speed. Add remaining sugar and mix well. Add more cream or powdered sugar if necessary to adjust the consistency. This is a simple and delicious dish for pork lvoers. The belly pork in this recipe is streaked with fat, but boiling reduces the fat considerably. If belly pork is too fatty for your liking, you can use shoulder pork but it has to be rolled up first. 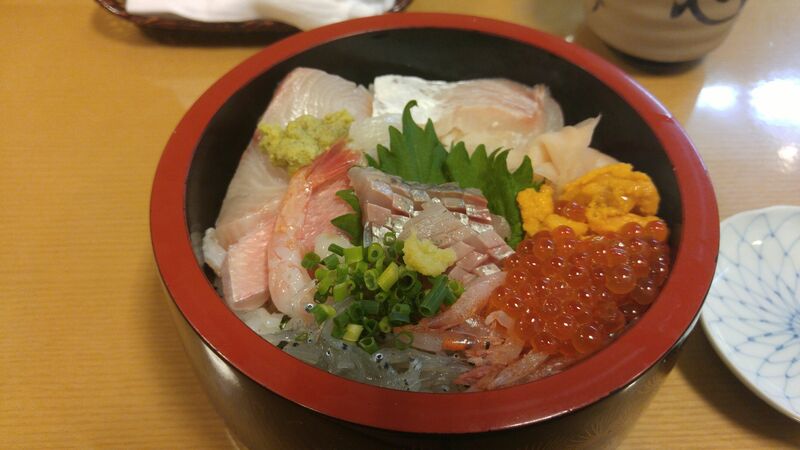 The meat should have a slight crunch to it - a little surprise for a boiled meat dish - and be very thinly sliced. The garlic sauce is pungent and tasty and typically Asian in style. Cut the skin away from the prok. Bring 2 litres of water to the boil. Blanch the pork in the boiling water then refresh in cold water. Change the water, bring to the boil, add salt, ginger and spring onions. Add the pork again and remove any scum that floats to the top. Turn flame to a simmer and cook for 30 minutes. Remove pork from the water dan insert a skewer into the meat. Check the fluid that runs out - it should be clear without any trace of blood. When pork is done, remove it from the pot and allow to stand for 30 minutes. Slice it into very thin slices and arrange on a serving plate. Drain the stock off the plate before serving. For garlic sauce, mix the ingredients together thoroughly. Pour the sauce over the pork slices. Garnish with chopped spring onions/coriander. This recipe from Chef Bernard Decaix is different as he does not have oil but 300 ml of the coconut milk required is enough to moist the cake. 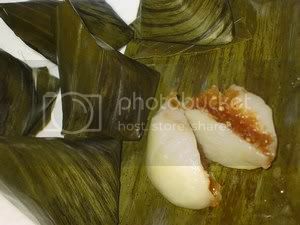 As usual, i do not use pandan leave juice but use 1 tsp pandan paste instead. I omitted pandan juice not by choice and i found that without it, the fragrance from the paste did not play second fiddle. Pre heat the oven to 180c/350 f(convection). Pour the coconut milk into a saucepan and add the castor sugar. Bring to a boil, stirring slowly to disslove the sugar. set aside to cool. 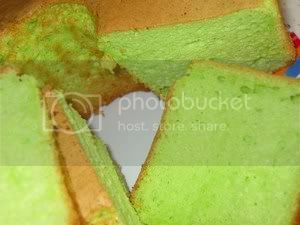 In a bowl, combine the egg yolks, coconut mixture, pandan juice and pandan essence. Whisk lightly, then add the flour to the egg yolk mixture. Mix until the batter is smooth. Set aside. Whisk the egg whites lightly and add in the cream of tartar and castor sugar. Continue to whisk until the mixture is stiff. Do not overheat or allow the mixture to become dry. Set aside. Fold in the remaining egg whites and work very lightly with a spatula. Make sure the mixture is well mixed. Place the finished mixture in an ungreased 10 inch chiffon cake /tube mould. Level and bake in the oven until golden brown (about 45 minutes). Remove the cake from the oven and invert the mould. Allow it to cool for 1 hour. In the old tradition, chocolate chiffon soaked with kirshwasser and filled with black bing cherries and whipped cream and now it has be adulterated by adding the kirsch into simple syrup. 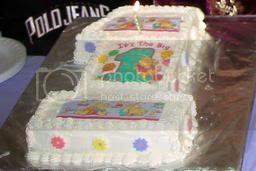 It is a very delicious change and a very popular cake for any celebration. This year i baked it for Jeremie's birthday. 1. Mix ingredients (A) well with a hand whisk. 2. Stir cocoa powder in warmed oil until dissolved and pour into yolk mixture. 3. Stir (C) into yolk mixture. 4. Sieve ingredient (D) and stir it into yolk mixture. 5. Whip egg whites in a clean mixing bowl until big bubbles are formed. Add in the cream of tartar and whip and add in sugar in 3 portions while whipping the whites. Whip until stiff peaks formed. 6. Pour 1/3 white into yolk mixture and blend well. 7. Pour yolk mixture into the remaining egg white mixture and blend well. 8. Pour batter into ungreased 9 inch baking pan and bake at 350 f for 45 minutes or until cooked. 9. Invert cake and leave to cool. Then cut cooled cake into 3 layers. 10. Whip the cream with icing sugar until stiffand leave in the fridge. 11. While cake is baking, prepare the filling. a. Strain juice of pitted cherries into saucepan. b. Bring juice to the boil and thicken with cornflour mixture. c. Bring back to the boil and cook for 1 minute. remove from heat and let cool. d. Add in the halved pitted cherries. a. Slice cooled cake into 4 thin slices. b. Place one slice of cake on a cake base and brush generously the simple syrup all over the surface. c. Cover cake with whipped cream and then 1/3 of the filling. 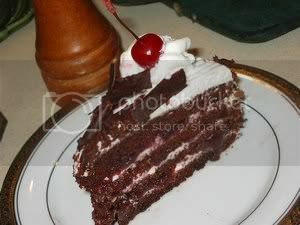 d. Top with another slice of cake and repeat process , simple syrup, cream and filling. 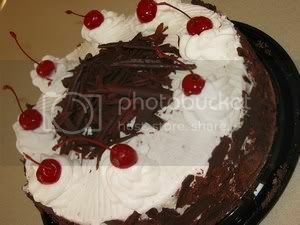 e. Iced the whole assembled cake with whipped cream and decorate with shaved chocolate and marachino cherries.